There's been something of a revolution in monitors and displays over the last couple of years as technology has brought some new innovations to the industry. A few years ago, it was the ability to have an internal front sensor in the monitor to assist in automating calibration. This past year saw the introduction of backlights, which are now predominantly LED [light-emitting diode] vs CCFL [cold cathode fluorescent lamp], giving the monitors the ability to achieve and sustain higher luminance levels or white point; the brightness value is two to three times brighter than the typical white point. LED backlights also provide the capacity to create an extremely high luminance in a small, localized area. "Productivity tools that are being provided by medical monitor manufacturers are not only improving the productivity of the radiologist but also enabling them to do a better job of understanding and diagnosing the image," says David Sorensen, director of operations for Richardson Electronics Healthcare in La Fox, Illinois. "The new LED backlight displays can boost the overall brightness without adding too much heat. They enable color displays to operate at much higher brightness levels as well as provide brightness overhead for longer product life. The additional benefit is that the technology is more green, since it is mercury-free." Lynda Domogalla, vice president of product marketing for Barco, Inc, says the company did a study a couple of years ago and learned that about 80% of radiologists experienced discomfort such as neck strain, back pain, and eye fatigue. "It was our goal to make it more comfortable and easier for them to stand in front of a display, to help the workflow," Domogalla says. 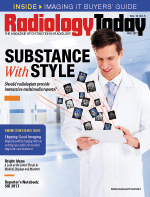 "That same study saw radiologists wanting to bring color and grayscale together. Anything you can do to improve clinical outcomes and make it easier for the radiologist to see the subtle details in an image and work more productively is what people are gravitating towards." Mic Dawley, marketing manager and product supervisor for Eizo Corporation in Cypress, California, says workflow is key throughout radiology. "Display manufacturers are building these features into the monitors to improve work efficiency," he says. Eizo has an efficiency feature called "Work-and-Flow" that comprises two items: "Hide-and-Seek" allows users to have the worklist monitor built into the diagnostic display, which reduces the need for a worklist monitor, saving money and desk space, and "Switch-and-Go," which removes the need for an extra keyboard, video, and mouse switch so radiologists can connect two PCs to the monitor and use a single keyboard and mouse. "Ergonomics has also been a big buzzword," Dawley says. "Stands that allow for many adjustments to position the display at a height that is perfect for the reader are in vogue. In addition, bezels have become smaller and not solely for aesthetics. If you have two monitors pushed together, a smaller bezel improves eye continuity, allowing for an easier transition from monitor to monitor." Other recent innovations include 5 megapixel (MP) color displays. Eizo plans a late summer or early fall 2017 release of their 5 MP color display. "Color display monitors have become widely popular over strictly grayscale displays. While color monitors display grayscale images well, they also can display color images and utilize color for all of the tools and labeling," Dawley says. "Adding color to this field of study has improved efficiency in that markers/tags regarding a question or comment about a particular image or something within the image can be quickly identified." Richardson Healthcare's latest series of displays come from its Image Systems N-series, which feature a sleek, slimmer bezel design. The series is highlighted by the C5MPn monitor, which is a 5 MP color display that supports breast imaging as well as all other modalities. It is specified at 800 cd/m2 [candelas per square meter] brightness, typically powered by an LED backlight, and includes front bezel, backlight, and ambient light sensors that are controlled by CFS Calibration software. "The Image Systems PinPoint feature highlights and enlarges a region of interest on the screen while distracting light from other areas of the screen and other displays are minimized, enabling better focus and understanding," Sorensen says. "And the Cursor Genie feature allows a user to find and move a mouse cursor in a much more productive way across multiple screens on a workstation." Digital breast tomosynthesis (DBT) is also becoming more prevalent; monitors capable of displaying mammography images, including DBT as well as other modalities makes the display more versatile. "Rather than a dedicated workstation for mammography, a doctor can use a display like the C5MPn to view not only breast images but all other image modalities as well, on the same workstation," Sorensen says. "And utilizing tools such as PinPoint, the doctor actually can focus better, without distraction, on the area of interest." While NEC Display is de-emphasizing radiology in its product offerings for 2017, many radiologists around the country are still utilizing its existing monitors. The company's MultiSync PA322UHD is a 32-inch 4K ultra high definition (UHD) display, which reaches color stability in less than five minutes. "The PA322UHD-BK-2 display's certification speaks to the image quality and stability of all MultiSync PA Series monitors utilizing our exclusive SpectraView Engine and backlight sensor," says Art Marshall, senior product manager of professional and medical displays at NEC Display, in a company press release. Domogalla says another evolving trend in monitors is the regulatory environment, which has become increasingly stringent on both national and state levels. She notes that Barco currently offers a full range of displays for diagnostic imaging and review, from grayscale to color with capabilities that focus on improving clinical outcomes and optimizing workflow for radiologists. "Their workload is growing, the amount and complexity of images to read is really expanding, and they are under a lot of pressure to read a lot of things in a short period of time," Domogalla says. "Barco has two families of products: Nio, which are industry-standard displays, and the Coronis family, which are high-end monitors with additional features that improve clinical accuracy and increase workflow." The company is also seeing a strong trend towards fusion displays, which replace two-portrait systems and offer flexibility. Radiologists can use one display to see images on one monitor. The fusion trend led to the Coronis Uniti, which allows users to view any type of image on one display in 12-million-pixel resolution, not only general radiology but also breast and muscularity on one image, including 3D, breast MR, and ultrasound. It's also designed ergonomically to fit in a radiologist's field of vision. "It's the first unified workflow, combining PACS and breast images on one workstation," Domogalla says. "It replaces all display configurations, eliminating the need for a multihead display setup or moving to another workstation to view additional exams. That [enhances] productivity and speeds up reading sessions." As for the next steps for monitors and displays in health care, Sorensen says they're likely to follow the path of the LCD [liquid crystal display] panel industry. "Larger and higher resolution panels continue to be developed in volume for a variety of uses outside of medical, such as 4K TV screens," Sorensen says. "Clinical-use displays based on UHD resolution monitors will become more prevalent. Monitor manufacturers need to add the features that make them useful for diagnostic use, including things like higher brightness, luminance sensors, calibration software, etc. Monitors utilizing resolutions that have limited use outside of diagnostic radiology will mean limited quantities and higher price points."